You’ll want to gobble up a bowl of delicious, hot soup today. March 30th is National Turkey Neck Soup Day! Which, let’s face it, is kind of bizarre. Turkey soup I could see. But turkey neck soup?! Sounds like something only Cousin Eddie would appreciate. Few foods are as quintessentially American as turkey. Not only is it synonymous with Thanksgiving, but every signature on the Constitution, the Declaration of Independence, and other important documents dreamed up by the Founding Fathers was inscribed using a turkey feather quill. By the way, ever wonder why turkeys are referred to as Tom? Benjamin Franklin jokingly called them that because Thomas Jefferson chose the bald eagle over the turkey to represent the new nation’s symbol. I guess Jefferson really ruffled Ben’s feathers. The turkey neck may not be the most popular part of the bird, but the meat it contains is pretty tasty – as long as you cook it for awhile. It is tough at first, but after several hours simmering in broth, it becomes quite tender and flavorful. Making a turkey neck soup was a breeze. 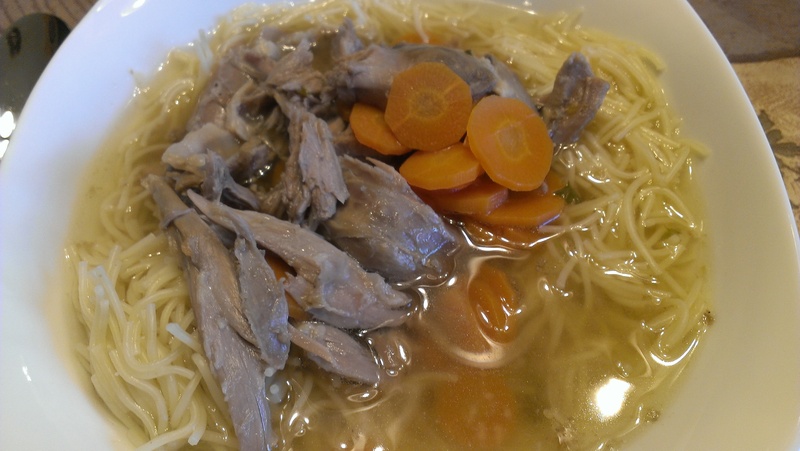 We had some wonderful leftover homemade chicken stock which we used as a base, along with the requisite turkey necks (surprisingly easy to find – thanks, mom! ), some carrots, celery, onions, garlic, bell peppers, fresh parsley, salt, and pepper. It made for a delicious lunch! You are welcome-it looks delicious! Thank goodness for Winco! I used to use the neck for broth and I have eaten it in homemade chicken and noodles but only because that is the only meat I had. Nice to know there is an actual day made for turkey neck soup. I think. My mom uses chicken necks to help flavor the gravy. I’ve tried the meat before and it’s good, but like I learned, just a little tough unless it’s cooked for a few hours. 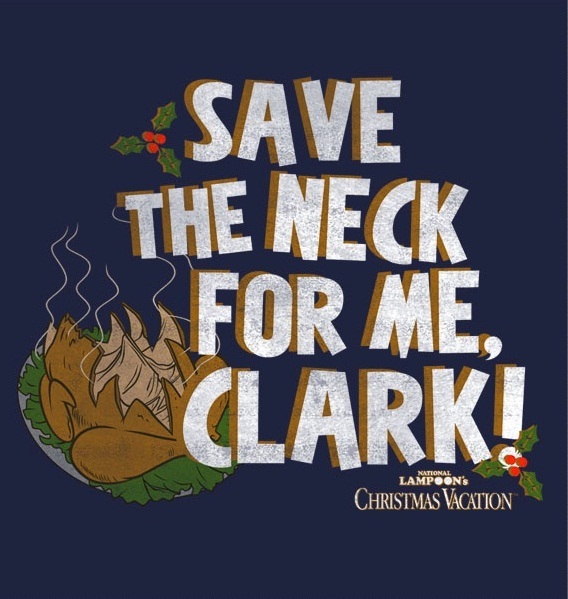 I think Cousin Eddie is onto something! I think my mom used to chop it up in the stuffing…..although I will just tell myself she threw it away with the rest of the innards…gah..i hate turkey! You don’t like turkey?? What do you do for Thanksgiving?